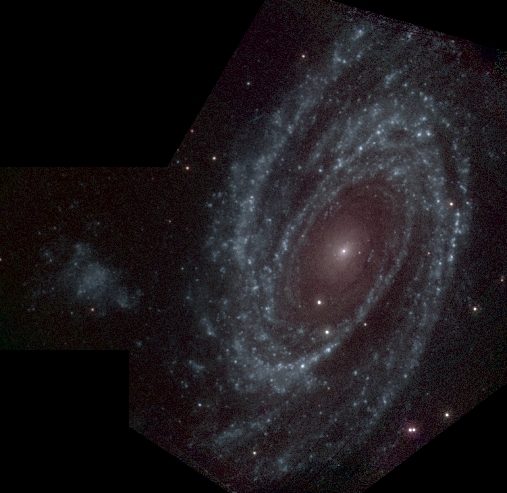 Image Credit: E.M. Huff, the SDSS-III team, and the South Pole Telescope team. Dark Energy drives the accelerating expansion of the Universe, and the imprint can be found in the distribution of galaxies. 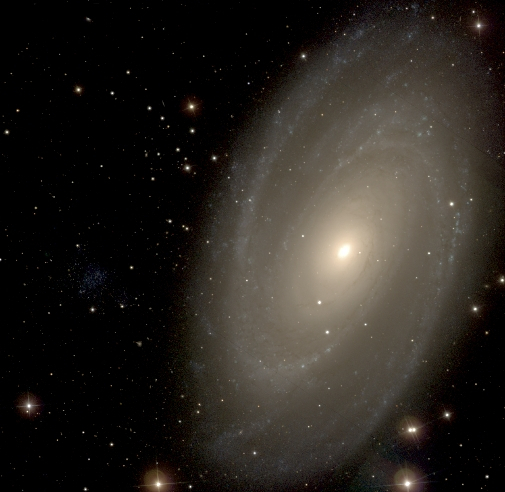 Now, researchers, including several associated with the University of Arizona in Tucson, have published a series of six papers (see below) concerning the distribution of galaxies 5.5 billion light years from Earth, using data from the Sloan Digital Sky Survey. 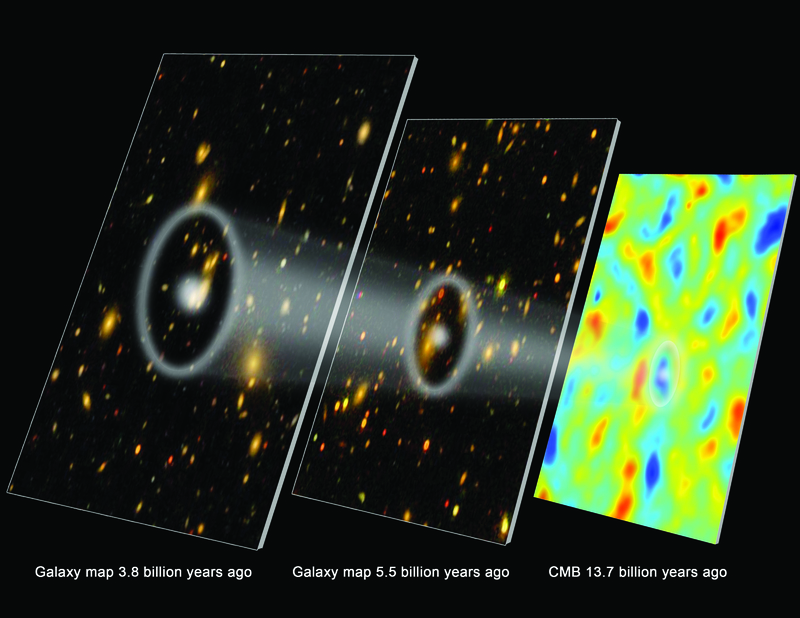 The papers detail how mapping the position of galaxies can measure how fast the Universe was expanding six billion years ago. The expansion is the result of Dark Energy, which makes up 72% of the universe in which we live (the remainder is Dark Matter (23%) and atoms (5%), found in intergalactic gas and stars). The image above illustrates how variations in the cosmic microwave background (due to baryon acoustic vibrations during inflation, which followed the Big Bang) are reflected by later distribution of galaxies, and measuring the distribution of galaxies at different times reflects the accelerating expansion of the universe. The original work on the accelerating expansion came from observations of type Ia supernovae in 1998 and and 1999, and led to the Nobel Prize in 2011. The Baryon Oscillation Spectroscopic Survey (BOSS) is one of four SDSS surveys, and the team of scientists and engineers that make up the team are the authors of these six papers. We have only one-third of the data that BOSS will deliver, and that has already allowed us to measure how fast the Universe was expanding six billion years ago — to an accuracy of two percent. This coupled with the previously released data on the distribution of galaxies at 3.8 billion light years, shows the accelerating expansion: the rate at 3.8 billion light years is more than the earlier rate at 5.5 billion light years. Due to the original oscillations in the universe, theory predicts that the average distance between galaxies would be 500 million light years. And this is what the BOSS results have shown. They are the best measurements to date. Anderson, L. M. et al. 2012, The clustering of galaxies in the SDSS-III Baryon Oscillation Spectroscopic Survey: Baryon Acoustic Oscillations in the Data Release 9 Spectroscopic Galaxy Sample, submitted to Monthly Notices of the Royal Astronomical Society and available on the arXiv preprint server (1203.6594). Sánchez, A. G. et al. 2012, The clustering of galaxies in the SDSS-III Baryon Oscillation Spectroscopic Survey: cosmological implications of the large-scale two-point correlation function, submitted to Monthly Notices of the Royal Astronomical Society and available on the arXiv preprint server (1203.6616). Reid, B. A. et al. 2012, The clustering of galaxies in the SDSS-III Baryon Oscillation Spectroscopic Survey: measurements of the growth of structure and expansion rate at z=0.57 from anisotropic clustering, submitted to Monthly Notices of the Royal Astronomical Society and available on the arXiv preprint server (1203.6641). Tojeiro, R. et al. 2012, The Clustering of Galaxies in the SDSS-III DR9 Baryon Oscillation Spectroscopic Survey: Measuring structure growth using Passive galaxies, submitted to Monthly Notices of the Royal Astronomical Society and available on the arXiv preprint server (1203.6565). Ross, A. J. et al. 2012, The clustering of galaxies in the SDSS-III Baryon Oscillation Spectroscopic Survey: Analysis of potential systematics, submitted to XXXXX and available on the arXiv preprint server (1203.6499). Manera, M. et al. 2012, The Clustering of Galaxies in the SDSS-III DR9 Baryon Oscillation Spectroscopic Survey: A Large Sample of Mock Galaxy Catalogues, submitted to XXXXX and available on the arXiv preprint server (1203.6609).